Deccan Rummy has always valued our rummy players’ feedbacks and suggestions and has incorporated many of them. We owe our success to our players who have been with us through thick and thin. Without them, Deccan Rummy would not exist or be as successful as it is today. Our players have always been our pillars of strength ever since our day of inception and their constant encouragement and support helped us churn out many rummy promotions and offers. We operate by the motto “All of your customers are partners in your mission” where customer satisfaction has always been our top priority. Our support team has ensured that all our customer queries are addressed within a short turnaround time (TAT) for which we have received a lot of appreciation & support from our Rummy players. We also thank the players who were patient enough to wait, during certain times where our responses got delayed due to unforeseen circumstances. Even demonetisation hasn’t stopped them. DeccanRummy has largely succeeded because of the quality of the players in our fold as much as the quality of our efforts. We have received tremendous responses for all our promotions from our players. All our tournaments remain houseful to this day which shows that the eagerness and enthusiasm haven’t died down. Want to know what our customers said about us? We will take this moment to highlight some of the nice things our players said about us as nothing draws a crowd quite like a crowd. “Heartiest thanks to Deccan rummy for conducting free tournaments and goldQuest Tourney, I won a gold coin in goldquest tourney. It’s been 2 months I am playing on Deccan rummy and I love playing here. Most importantly I trust this game and site. Though I play rummy on other sites Deccan Rummy is a great way for me to earn money where skill and concentration and luck are the inputs. I referred to so many friends to play this game and I will continue this as long as possible. I love playing here and thanks for giving this opportunity for sharing my feelings”. “I have been playing on Deccan Rummy site for some time now and found it better than others. The ultimate joy was to win a GoldQuest tourney which I thought was impossible but….ALL THINGS ARE POSSIBLE ON DECCAN RUMMY”. “I am very much excited to have won a gold coin. I am feeling great to be a winner. 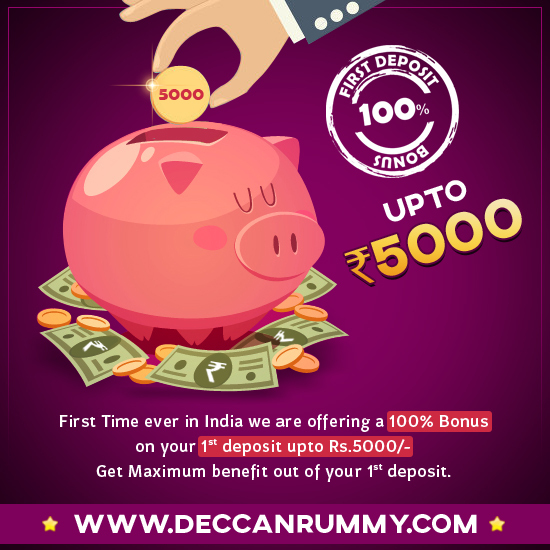 Thank you so much Deccan Rummy for providing many offers and conducting many tournaments. I have played almost in all Indian rummy sites. DECCAN RUMMY is the BEST among the all aspects, conducting tournaments, Bonus, Customer support .Once again, Thank you DECCAN RUMMY”. 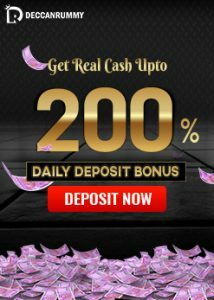 “Really I felt amazed to won a gold coin from your Deccan Rummy portal, it is one of the sincere website portal to play and the playing limits as well as giving opportunities like 3 persons in first round and 2 persons in second round, u give more opportunities for the players and the games also restricted. Always I support Deccan Rummy“. “It’s been wonderful experience to play on Deccan rummy. I won this gold for my beloved and yes its happy moment for me”. Wow! Thank you very much, guys, for your kind words. We are absolutely overwhelmed by the praise and love you have showered on us. It gives us immense strength to strive even harder. Skeptics can bad mouth and trash all they want about the online rummy industry, but the bond between us and players is unbreakable and growing stronger every single minute. Moreover, the game has been declared as legal by the supreme court of India. So we can turn deaf years to their constant kvetching. The online rummy industry is here to stay and because of our players’ solidarity and support, Deccan Rummy is marching ahead of our competitors. Together we shall make history in the rummy world!! Our goldQuest tourney has made heads turn by the rummy contingents with its huge success. Right from the day of its inception, goldQuest tourney has been very successful in attracting players across our country without any barriers. New players are absolutely fascinated by the offer and are eagerly participating in this tournament. Winning a brand new gold coin has always been a dream. To stick their neck out and battle some of the experienced players take a lot of heart and courage. Many of them much to our surprise have been successful in their first attempts. This shows that nothing is unconquerable in this Online rummy world. We appreciate their monumental efforts from the bottom of our hearts. 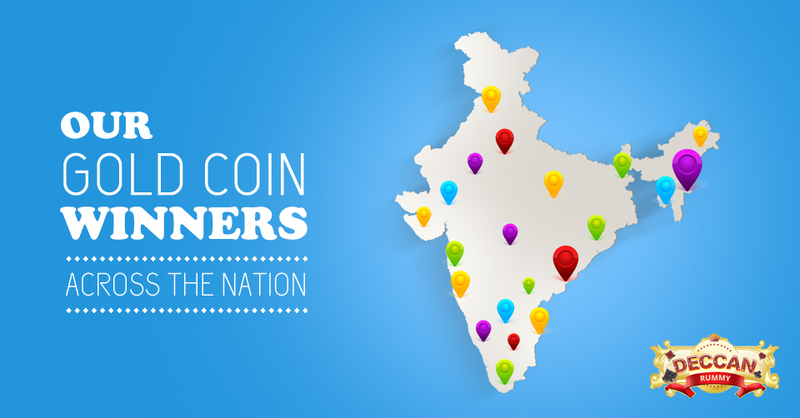 Several gold coin winners are from rural parts of India much to our surprise. This indicates the depth the rummy tournament has penetrated. We never expected this kind of response when we first announced this promotion, to be fair. The overwhelming response to this promotion made us announce this tourney as a routine affair. The curiosity and excitement for this tourney hasn’t toned down a bit to this day. The reason we believe for the massive success of this tourney is its simple structure that saves the players from toiling hard. End of the first round also called as Quarterfinal, the player who has the maximum points in each table moves to the second round. The end of the final round, the player who has the maximum number of points after the three deals will take home a 0.5 gm 999 Gold Coin. We know for a fact that winning is not everything in sports – those who have lost games will definitely know that. A game you lose fighting hard is more gratifying than winning games at ease. Rummy is a game similar to roller coaster – there will be ups and down. 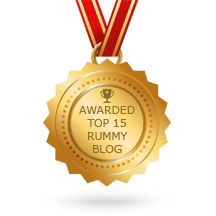 Winning and losing happens very frequently for a rummy player. It is important to keep your feet on the ground and remain unfazed by wins or losses. As mentioned earlier, nothing in the world is insurmountable when you remain stapled with grit and determination. You can enter the tournament at no entry fee by simply registering your entry at the goldQuest option under Tournaments tab in the lobby section, after logging in to your account. Only 180 seats are available. Grab your position as soon as you can!!! Time the game starts: Every day at 1 pm. Entry to this tournament is restricted to players who have earned minimum 100 loyalty points within last three days. Please refer our article on Loyalty points to know more about it. For those who couldn’t make the cut, don’t feel disappointed; continue playing and the victory that is eluding you will fall in your lap sooner than later. The fan base for this tournament continues to grow exponentially. It’s time for lurkers to jump into action as just 180 seats are available in the goldQuest tourney per day. So, better hurry up and register now. Play Rummy with us and bestow upon yourself this golden opportunity. Games like rummy that we played with friends during our childhood have always been memorable and cherished moments in our lives. Card games have also been portrayed in a lot of movies. Remember those awesome days when we played rummy with original cards, clustered in a table or a veranda? Remember the little scuffles and altercations because of card games that ended with a big chortle? Card games helped us to develop a close bond. We sure reminisce about those colourful days more often than not, isn’t it? How many times do we wish to time travel to our youth to relive all those exciting moments where we played, fought and enjoyed with our friends? DeccanRummy is out to provide you a platform to relive such memorable moments. Did you know that you can earn money every time a new player signs up with us through the Bring-A-Friend tab in your account? While it’s always fun playing rummy with your friends, it’s much better if you’re getting rewarded by playing so. Referring a friend, acquaintance, well-wisher or relative and making with sign up with us could earn you a lifetime bonus. Not bad for something that only takes a bare minimal effort, right? In addition to some extra cash, you are letting your friends know about an exciting rummy site in the process and entitling them to the same excitement that you’re having with us. There’s no limit to the number of friends that you’re allowed to refer. Cash will keep flowing through the Refer A Friend program as long as they keep playing with us. 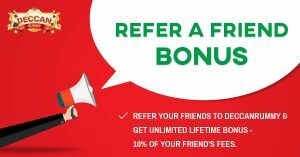 Once you introduce your friends, you will get “Unlimited Lifetime Bonus”-10% of your friend’s fees for every new friend you refer on Deccan Rummy. In addition to bringing you lots of money, Your friend can then play all the games, tournaments, avail promotions, bonuses etc! It’s a win-win situation for everyone. Maximize the benefits of this offer by referring as many friends as possible. Click on My Referral Code where you will find a unique link that you can share with your friends. Mail the link to as many friends as possible and do remind them to register with us. Click on Refer Friends tab and enter the email of addresses of all the friends that you want to refer and click on Send Message button after entering the correct captcha. Your friends will receive a Joining invite with a custom message from us. Here’s a look at how you go about earning the bonus. As mentioned earlier, 10% of your friend’s fees for every new friend you refer on Deccan Rummy for life. Once you earn 1000 referral points, you will be eligible to redeem it. 1000 referral points will give you Rs. 100 to your account. Players can redeem their referral bonus by entering the number of points they wish to redeem (min 1000 points) in the box below and click on Redeem. This promotion is limited to one account per customer. Account sharing is strictly prohibited. Multiple registrations for a single player is strictly prohibited and if found it may result in a permanent ban. The friend you invite must not have already registered with Deccan Rummy. 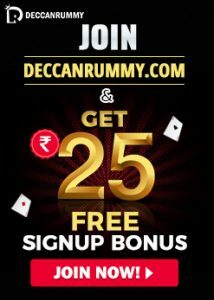 Deccan Rummy reserves the right to modify/cancel this promotion or to discontinue it at any time without liability and without notice. The decision of Deccan Rummy will be final and no further correspondence shall be entered into in cases like validity/eligibility of any entry. Players can refer rummy rules and how to play rummy tutorial in our site for a better understanding about the game. *Standard Deccan Rummy terms & condition apply.